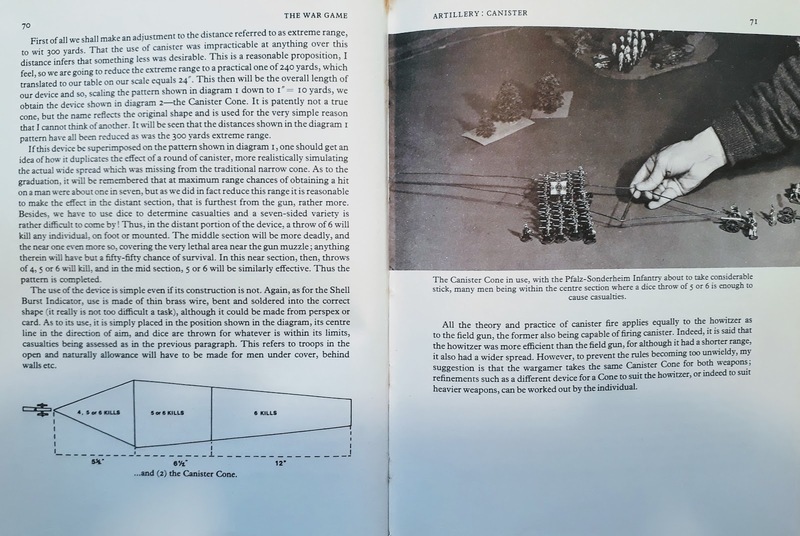 When you look at the history of wargaming, there are all sorts of strange contraptions that various rulesets use to determine area effects of firing. Most of these come in the form of firing templates. Usually, the template is placed on the table, and all figures underneath the template have some probability of getting hit. Templates are an old idea. Below you see a cannister template from The Wargame by Charles Grant, which was soldered together. Here's another curious template, from Don Featherstone's Advanced Wargames. In order to bring more variability (and randomness) in the fire effect, some rules also specify that the template can "deviate" from the original position. A random direction is determined, a random distance is rolled for, and the template "deviates" that particular distance in that particular direction, to determine the final area where the firing will have an effect. 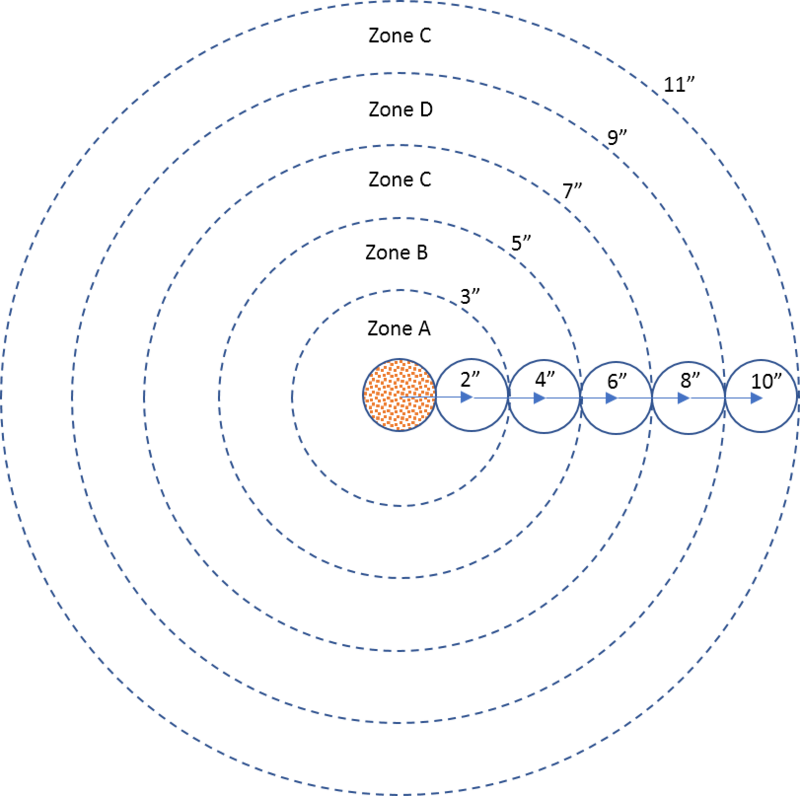 There are various possible mechanisms to determine this random direction and random distance, and especially fantasy and science fiction rules have used a whole zoo of variations on this theme over the years. 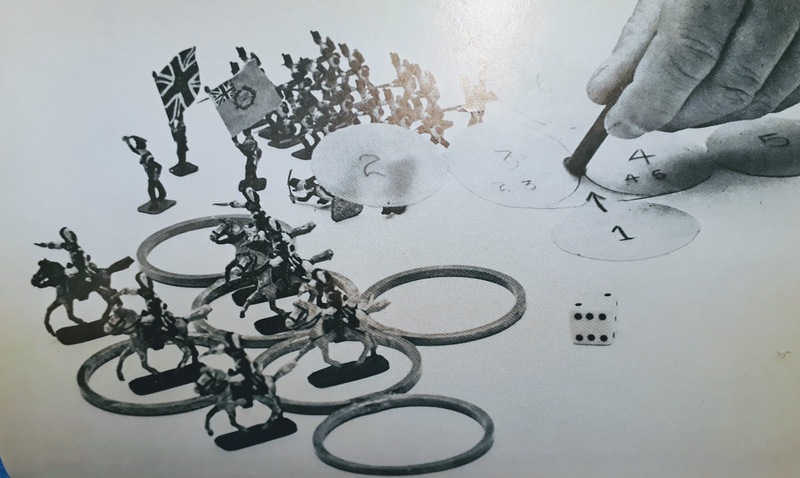 It will be impractical to analyze them all in terms of probability and effect, but I have chosen one particular procedure using the "scatter die" and "artillery die", I believe first pioneered by Games Workshop back in the nineties (any corrections welcome!). Place the firing template over the intended target. Roll the scatter die to determine direction of deviation (the direction of the face-up arrow). 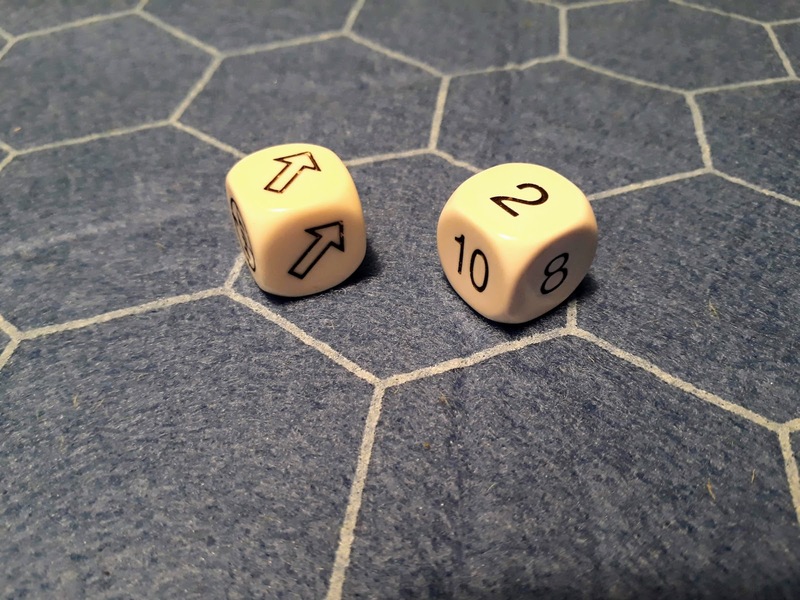 However, the scatter die also has 2 "Hit" faces, indicating no deviation at all. Roll the artillery die to determine the distance. The die can give 2, 4, 6, 8, and 10 as a result, along with a "misfire" that usually ends up in some hilarious effect for the crew firing the war engine. What I want to do next is to analyze this procedure in terms of "probability getting hit" when a figure is located somewhere within the possible deviation area. I will not consider the direct hit or misfire effects, since these should be considered as separate probabilities and events. We will only look at the probabilities when scattering does take place, with any of the 5 possible distances. Let's take a look at where the template might end up when there is a deviation. To make matters easier, we will consider a template with a 2" diameter (1" radius), and consider the artillery die distances in inches as well. This is a common application of the procedure, and can also be found in various Games Workshop games. The diagram below shows the possible positions for the template, when the deviation would happen in the horizontal direction. When taking into all possible random directions (a few are drawn below), a pattern starts to emerge. It is obvious that the further you move away from the initial position of the template, there is less chance that any particular area will get covered by the deviated template. 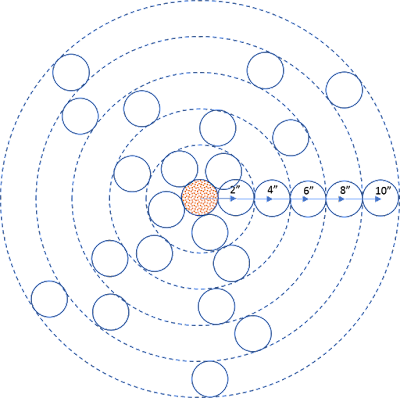 Indeed, the same number of possible template positions have to cover an ever-increasing larger circular area. Hence, the closer you are to the initial point of impact, the higher the probability your figure will be hit. Let's look at this probability in some more detail. Because the artillery die has equal probabilities for distances 2, 4, 6, 8 and 10 (remember, we ignore the misfire result), there is an equal probability for the template to end up in any of the 5 concentric circles. (7*7 - 5*5) times pi (area of a circle is pi times its radius squared) = 24pi. We made a simplifying assumption that the figure only has the dimensions of a single point. In reality, the figure itself covers some area, and if you count overlap between the figure and the template as well, probabilities will go up somewhat. 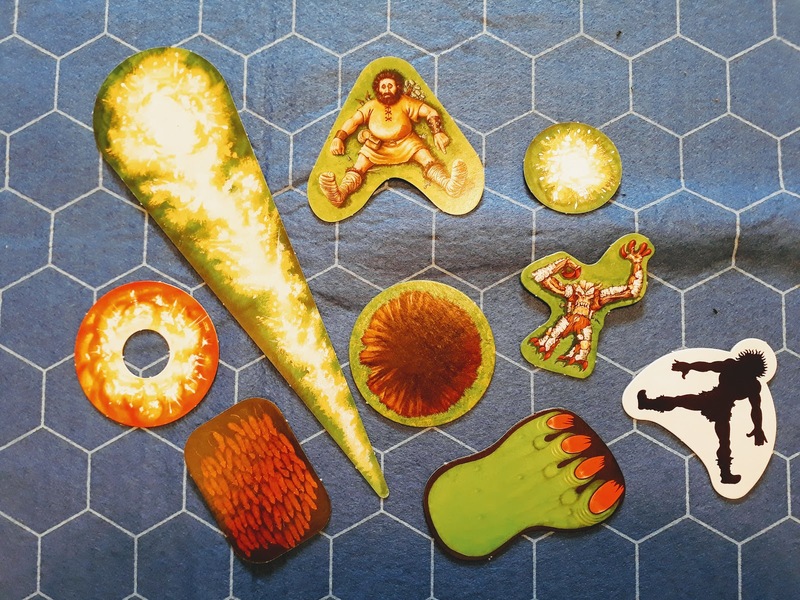 BTW, this is one of my objections against using templates which are too small or have a strange shape w.r.t. to the size of the figures, since discussions w.r.t. overlap will always arise ... but I will keep that discussion for another blogpost. So, one can see this is a degrading probability the further the figure is located away from the point of impact. Depending on your assumptions on how such deviation should be modeled, this might make perfect sense. But you can also wonder how you will have to adapt the probabilities for ending up in each zone, such that the probabilities of getting hit are equal anywhere in the possible deviation area. The analysis made above is also related to the problem of generating points in a circle with uniform probability, which is often a textbook exercise in many Probability 101 classes. Since the area of increasing concentric range bands goes up quadratically (a pattern that you can also see above), a random point can be generated by picking a random direction, and picking a random distance from the origin by taking the square root of a uniform random number generated between 0 and and the radius squared. 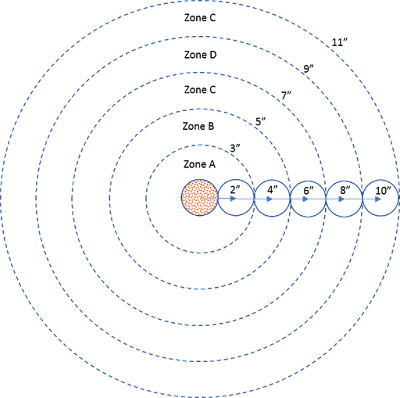 Simply picking a random distance uniformly between 0 and the radius would produce a spread of points located closer to the centre of the circle. You could use 'percentage dice' (they do exist as pairs of ten-sided dice or sometimes icosahedrons. The numbers would have to be rounded, of course to whole percentage points, and 00 would count as 100. Having said that I think the probabilities ought to go by a different function. If you took the probabilities of landing in each zone - including the 'bulls-eye zone - as equal, you would probably be nearer the mark. Take a look some time at a well used dartboard. You will find the distribition of holes making a distanct circle about the bull and about the triple-20 as well. The bull itself will have a scattering of holes, which thicken about half an inch out then gradually thin out towards the rim. I have a feeling that the fall of shot of artillery would describe a vaguely similar distribution, somewhat elongated along the axis of the direction of fire. I knew I'd gone wrong in there, took me half a minute after hitting 'publish' to spot where.